Since 1918, Nyemaster Goode, P.C.—Iowa’s largest law firm—has developed and maintains broadly diverse practice areas. For more than a century now, the firm has worked with its clients to address the most challenging legal issues. With extensive experience and thorough knowledge, Nyemaster attorneys are forward-thinkers with a focus on solutions. 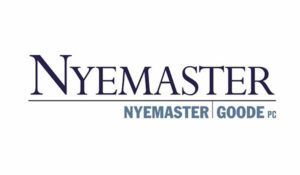 Nyemaster is a full-service firm with specialists who collaborate to provide the most effective counseling and representation for the legal issues presented by each client’s unique circumstances. Nyemaster’s practice areas encompass diverse aspects of business enterprises: Business, Finance, and Real Estate; Government Affairs; Intellectual Property; Labor and Employment; Litigation; and Tax, Estate Planning, and Employee Benefits. The concentrated specialty practices complement each other, and together provide comprehensive representation of each client’s interests. Nyemaster’s specialized insurance attorneys are steeped in the industry, and with its home office in a national insurance capital, Nyemaster routinely advises insurance clients in both complex and routine matters. Nyemaster attorneys regularly assist in transactions such as formation and licensing, mergers and acquisitions, and capitalization planning and implementation. They frequently represent insurance clients in regulatory, compliance, legislative lobbying, and other matters reaching across multiple states. Nyemaster is committed to providing clients with responsive, professional, and cost-effective legal representation. As its next century begins, Nyemaster is recognized for quality services and multifaceted expertise, including areas of law that didn’t exist in 1918—or even 10 years ago. Dedication to ethics, demand for excellence, and abiding respect for its responsibility to clients are qualities inherent in Nyemaster.